Last week, I posted this at the Market Square Concerts Blog when The Four Nations Ensemble and a group calling itself "Music from China" came to town to perform music from the French Baroque, mostly from the time of Louis XIV and the Palace of Versailles interspersed with music of the "classical tradition" from China, using the Imperial Palace of The Forbidden City as its metaphor. Since it took me several days to research and write the post, I thought I would add it here, as well. Though they’re playing Handel, here, rather than, say, Couperin, it’s a chance to dip your toe – or, better, your ear – into the sound world of the Baroque. Their program here was called “Plum Blossom and Fluer-de-Lys: Music of War and Peace in the Forbidden City and Versailles.” And while I might have wished for more prefatory detail about the unfamiliar Chinese music and perhaps some translations for the picturesque titles of the various French pieces for those of us not fluent in the langauge, the thing I missed most was a chance to find out a little bit more about the instruments, whether French or Chinese. For the audience, most of the time the Chinese instruments were partially hidden behind music stands. While a lecture recital wasn't the object, here, I felt an opportunity was missed to communicate with an audience experiencing this for the first time. It’s not really an odd combination at all, if you think about it - this combination of French and Chinese music - the difference in the sound-world aside. If the Language of Music is truly international, it’s only the surface “dialect” that changes. Beneath that surface lies a varied world of commonalities rather than differences. Though most of the French works on the program have “abstract” names – suites and things like that – individual movements may have descriptive titles. However, all you have to do is look at the offerings on the Chinese side of the program to see titles like “Quietude” or “The General’s Command” and, of course, “Ambush on Ten Sides” which will probably bring to mind (dramatically, at least) any number of fight scenes in classical Chinese martial arts films. The event describes dates back to a historical event in 202 BC but the music became a virtuoso piece for the pipa or Chinese lute sometime in the 17th Century; a famous version of it dates from 1818 with several other arrangements and versions of it available. With all the talk about personality types and the psychological tests that exist to evaluate them and ways of determining who is a Left-Brained person and who’s a Right-Brained person, I’m reminded that composer Ned Rorem used to describe everything in terms of being either German or French. As national stereotypes go, it seems fairly accurate: the Germans are traditionally tradition-bound and precise (I used to joke about a Berlin-born friend who would become frantic is we were a few seconds late) where the French are typically more laissez-faire about life in general. Things that might be described more recently in pop-psych terms as being Left-Brained (logical and objective) would be, to Rorem, “German.” Things that were Right-Brained (irrational and subjective) would be, then, “French.” Having lived in Paris much of his life, he quite possibly had enough experience to make this generalization. It may or may not be an accurate stereotype, dealing with the two major cultural and political nationalities in Asia, but it has something to say for the Japanese love of technology (logic) and, if nothing else, a more picturesque and impressionistic (subjective) approach to art and music in China that is very akin to what we in the West are more familiar with in French art and music. The argument, I think, falls apart when discussing Japanese art which is, after all, its own adaptation of what were originally Chinese influences, and has many of the same traits. It’s true than many Japanese composers – Toru Takemitsu, perhaps, the most familiar to Western audiences – are stylistically full of impressionistic titles and hazy Debussy-like harmonies. Anyway, keeping the possibility of these contrasts and similarities in mind, a journey to Paris and Beijing might at first seem an odd pairing for a classical music concert, at least as we normally think of them. But when you look at the Big Picture – in this case, music as an International Language – perhaps it’s not so unusual, after all? While it would be easy to call this week’s concert – the last one of the official subscription season, believe it or not – “East Meets West” or something stereotypically bland, it’s more than just a collection of pieces from Western Europe and pieces from China. Since music was a fundamental part of aristocratic life – more so in 17th and 18th Century Europe as we’re used to with music of the French and German Baroque and the musical life of Mozart and Haydn’s day – it wouldn’t be a big stretch of the imagination to realize music was a very important aspect of the aristocratic life in China as well. The only problem is, most of us in the West are unfamiliar with even the basic details of Chinese history. If we’re familiar with the names of a few dynasties – the traditional way of describing its historical eras – it’s more likely the dynasty’s name will be followed by “vase” or “poet” rather than approximate dates or the equivalent to whatever era was happening in Western Europe. To many audiences today, used to Beethoven and large orchestras in vast halls (not to mention amplification in popular music), instruments like viols and harpsichords may seem quaint, the bailiwick of the historically informed “Period Instrument” world. 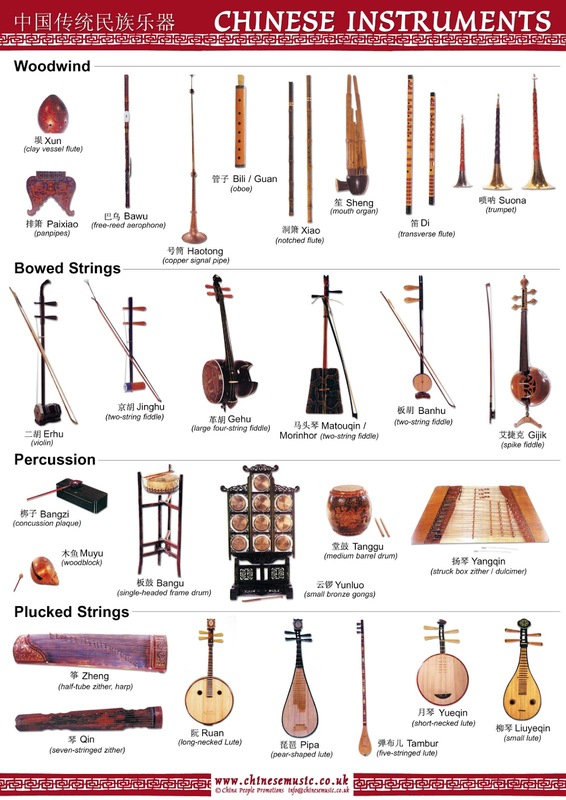 So, imagine being confronted by the variety of instruments played in China. We might think of the er-hu as “The Chinese Violin” but there are numerous types of such violin-like (or more specifically, viol-like) instruments. Yes, they are divided into the equivalents of string, wind and percussion instruments just like their Western counterparts - flutes, oboes, lutes, zithers and dulcimers - but they have different sounds, tunings and playing techniques that create, on the surface, a different world of experience from the Western instruments we might be reminded of. But then, for many in the modern day audiences, sometimes the sound of a viol or a harpsichord or a recorder will sound just as different from the traditional violin, piano or flute. Here’s another ensemble (Jordi Savall and Les Concerts des Nations) playing the second half of a work The Four Nations Ensemble has included on their Market Square Concerts program: from the fourth of the “Concerts royeaux” (Royal Concerts) which were composed for the Sunday concerts King Louis XIV requested – no, “commanded” – for entertaining his court living at the Palace of Versailles. Louis XIV is the epitome of the 18th Century absolute monarch with its whole concept of the Divine Right of Kings. Called “the Sun King,” a nickname which didn’t need to originate with sycophantic courtiers, Louis le Grande, the center of France's royal universe, ruled for 71 years, the longest reign in French and, for that matter, European history. He died days shy of his 77th birthday and had outlived so many of his heirs that his great-grandson become his direct heir, a boy of 5 who became Louis XV. It may have been, to borrow a phrase from the English author Charles Dickens writing about a slightly later time in the history that affected another resident at Versailles, “the best of times, the worst of times,” with periods of great cultural achievements in the arts and frequent periods of warfare, but above all it was an age defined by the king’s palace. Not just any palace, but one where he required many of his aristocrats to live with him – all the better to keep them under control (especially the ones who had participated in the rebellion known as The Fronde during his childhood). Through an elaborate court ritual, the king was aware which of the nobility was there to attend him (or wait on him) and who was absent, which he was then able to use to distribute favors. 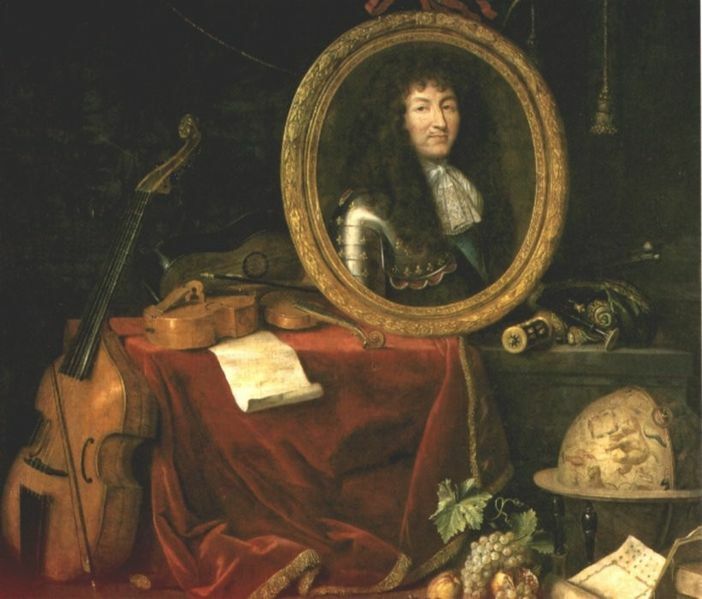 Whether “Sun King” referred to Louis’ brilliance, his life-giving benevolence or the fact he was the center of the courtly universe revolving around him, this helped to weaken the power of the aristocracy and, among other things, to coalesce the unwieldy and still largely feudal society into a strong central state which made France one of the leading powers in Europe during his reign. This place was called Versailles, and quite a place, even today. 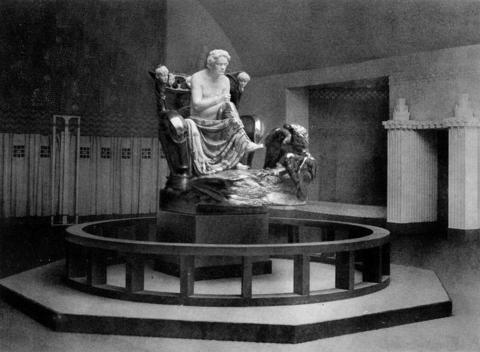 It’s now a museum for a Golden Age in French civilization. It hallways and rooms as well as the art that adorns them evoke a time we can only imagine. 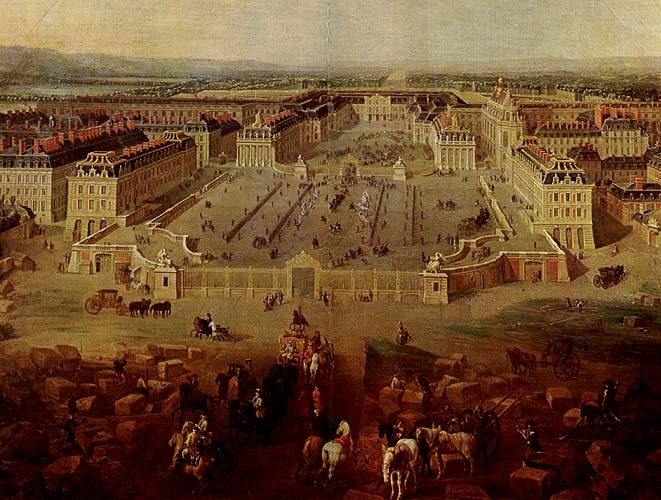 Louis XIV’s father, Louis XIII, had turned a former hunting lodge into a royal residence around 1624. Louis XIV, then, turned it into one of the most magnificent royal palaces in Europe and the home of French kings until 1789 when Louis XVI – the grandson of Louis XV who himself ruled 58 years – was overthrown in the French Revolution and guillotined in 1793. Since then, the palace was rarely lived in: Napoleon’s second wife lived in some apartments in the main building, but the Emperor preferred the Grand Trianon, a smaller retreat in a corner of the Versailles grounds with its own park. When the monarchy was restored, French kings did little more than visit the palace and eventually it became a museum and, in modern times, a major tourist attraction. It may still be used for state occasions and grand congresses but for little else, at least as it was originally intended. For instance, it has over 720,000 square feet of floor space, 2,300 rooms (of which the famous Hall of Mirrors is only one) and 2,153 windows. The collection is home to over 6,000 paintings, 2,100 sculptures, 1,500 drawings and 15,000 engravings, over 5,000 pieces of furniture and objets d’art. 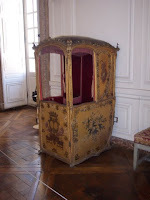 One item may look curious (see left): this was a single-occupancy "taxi" that would be carried on poles like a palanquin so the royal feet did not need to tire themselves out when traveling from one end of the palace to the other. The music associated with the age of the French kings living at Versailles can only be imagined, however. Many of the greatest musicians living in France at the time worked or performed there. 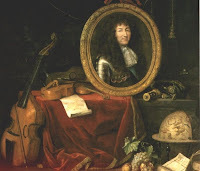 There were numerous ensembles for various occasions, from the king’s private orchestra called of Les 24 Violons du Roi (which was actually a string orchestra founded in 1626 by Louis XIII) that was later supplemented by an additional 16 players. There was a grand band for ceremonial purposes with winds and brass – and orchestras for the opera or the Royal Chapel could be created by combining members of the string and wind ensembles. These were largely disbanded or reduced in 1761 due to budget cuts – even at Versailles – but then, Louis XV was more interested in math and science, less so in music compared to the two previous kings. And now, a world away – to China. We remember important facts about ancient Empires – Alexander the Great and the expansion of Rome across the “known world” – how things fell apart with the barbarians and maybe how Charlemagne created the Holy Roman Empire out of the medieval rubble (though the most we remember of it was “it was neither Holy nor Roman”). 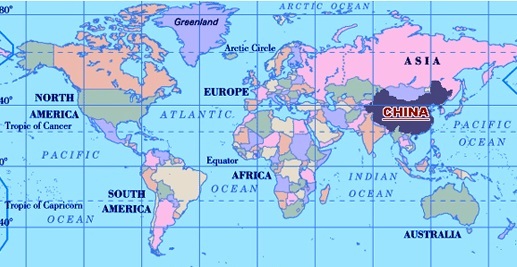 So if Alexander’s empire is dated to the 300s BC and that Rome flourished around the rise of the Christian Era (since we divide time into BC=Before Christ and AD=Anno Domini, in the year of Our Lord) and Charlemagne lived around 800 AD, it might come as a surprise to realize “written history” in China dates back to the Shang Dynasty before 1,000 BC or that the first truly united centralized state we now think of as China originated with Emperor Shi Huang-ti (literally “The First Emperor” in Chinese) in 221 BC, initiating a state generically considered Imperial China that lasted until the Revolution that established the Republic of China in 1912 AD – a total of some 2,100 years of more or less direct continuity. Compare that, for instance, to the Roman Empire which lasted only some 500 years, much of which was spent in political free-fall and social chaos after which the surviving Eastern Roman Empire (the Byzantine Empire) continued to shrink until 1453, almost 1,000 years later, when it fell to the rising Ottoman Empire. And compare that longevity to our own history – a government that has been in existence some 237 years. Chinese history is divided (like Egypt was) into its various dynasties. Curiously, the dynasty Shi Huang-ti founded barely outlived him. On the program, you’ll find references to the Han Dynasty (between 206 BC and 220 AD) as well as the Qing, the last official dynasty of the Empire which ruled from 1644 to 1912. Alas, it seems the music marked on the program as “Han Dynasty” is not from such an ancient age as that – the Red Herring I referred to earlier – but to a style that developed during that time period: this particular piece was inspired by a poem of Li Bao (or, in a previous transliterating of Chinese names, Li Po) who lived in the 8th Century during the Tang Dynasty, considered a Golden Age of poetry if not Chinese culture in general. If I read the Music from China website correctly, a piece with the title “The Moon Over Fortified Pass” was actually written in 1995 (AD) by Huang Qiuyuan, then a composition student at Beijing’s Central Conservatory. Though in actuality, it is based on a “type of military music known as Gujiao Hengchui (Music of Drums, Horns and Transverse Flutes)” that has existed since the days of the Han Dynasty. “These tunes, numbering fifteen in all, were sung and played by soldiers on horseback patrolling the frontiers. Noted Tang dynasty poet Li Bai [a.k.a. Li Po] (in the 8th Century AD) wrote lyrics for some of this music, the most famous being The Moon Over Fortified Pass." So while the tradition might be very old and the music written down sometime before the 8th Century, it forms the basis of a more modern setting which helps preserve an ancient tradition. The later Qing Dynasty, meanwhile, would be roughly parallel to the time of the French Kings at Versailles – as well as the rest of the 18th and 19th Centuries in European history. We know a refined musical culture existed in China even before The First Emperor in 220 BC: the earlier Zhou Dynasty (1122 to 256 BC). 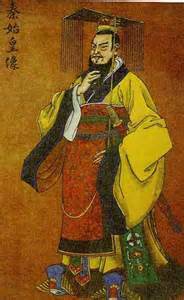 The debate about “popular” and “art” music was raised in a question by a powerful ruler to his advisor, Mencius, around 300 BC, whether it was “moral” to prefer popular music to the classics (Mencius diplomatically answered it didn’t matter so long as the ruler loved his subjects). Shi Huang-ti established, among so many other things in his centralizing bureaucracy, an Imperial Music Bureau to “regulate” various aspects of court and military music and determine which folk songs, for instance, would be officially recognized. While musicians were generally lower in status than poets, rulers even before the empire would send out scholars to collect folk songs to “check the will of the people,” many of them dating between 800 and 400 BC. The earliest surviving written music is a song, “The Solitary Orchid,” attributed to Confucius who died in 479 BC. 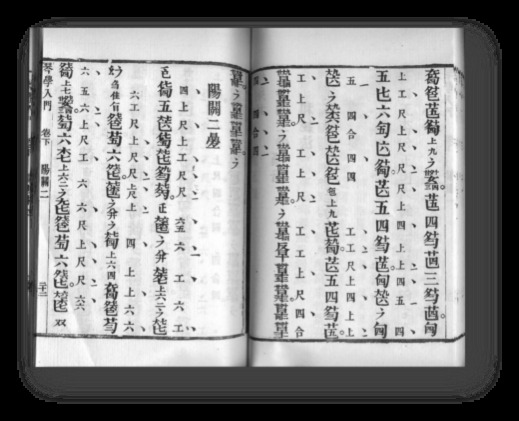 This collection of songs, incidentally, was one of the books banned and burned by Shi Huang-ti (he buried hundreds of scholars alive for hiding some of these banned books) and it had to be reconstructed from memory in the years following the overthrow of his not-so-powerful son. While much of the performance details of this music would have been passed on orally from teacher to student, the first great flowering of written instrumental music for the ch’in (or qin) of the zither family (which originally dated back to 2500 BC) was in the Tang Dynasty (618-907 AD). Here, for instance, is a musical manuscript for the ch’in dating from 1425 (see left). It is a kind of notation familiar to lutenists studying Renaissance and Baroque music who have to master complex forms of tablature that many, in exasperation, joke must have been invented by a blind person. This kind of notation still exists today, though greatly simplified, in popular sheet music that may include “guitar chords” representing the basic strings and frets of the guitar neck and where the fingers would be placed to play the correct pitches. 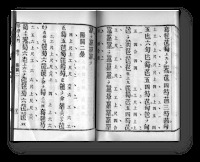 Earlier systems of notation in China might use a series of markings given picturesque names to indicate types of attack or groupings of notes that might be comparable to the neumes of Gregorian chant or the ecphonetic notation you might find in Hebrew Bibles prior to Christianity. Later notations used numbers to designate pitches, just as we use letters – A, C, G and so on. Marco Polo aside, incidentally, the first known account of East meeting West – at least, musically speaking – would be the arrival of an Italian Jesuit Matteo Ricci who presented the Emperor with a harpsichord in 1601. He trained four eunuchs to play the instrument. 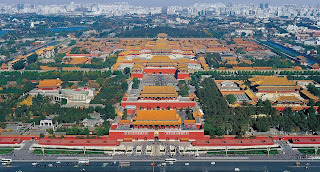 The Chinese equivalent of Versailles is a series of palaces enclosed behind walls and gates in the center of Beijing which had served as an occasional dynastic capital before it became the Imperial Capital during the Ming Dynasty around 1400. The old Tianning Pagoda may date from the 1120s but the city underwent many transformations, having been captured, burned to the ground, rebuilt and then abandoned between then and 1406 when the Imperial Palace was begun, completed in 1420. 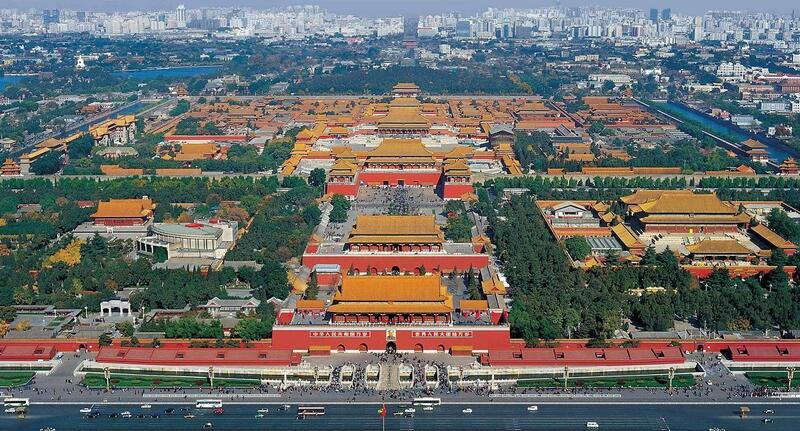 It became known as “The Forbidden City.” Beijing then remained the Imperial Capital ever since. The entire complex consisted of numerous buildings – palaces and temples, mostly, and ceremonial gates – all within a walled complex covering some 7,800,000 square feet. 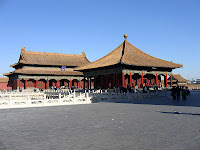 Its “Outer Court” was used for ceremonial purposes and the Emperor and his family lived within the “Inner Court.” There was a rigid hierarchy regulating everyone in relationship to the Emperor who, whatever his name or reputation, was called “The Son of Heaven.” The bureaucracy and ritual of the Forbidden City would make Louis XIV’s Versailles look simplistic by comparison. One of the great emperors of this dynasty was Qianlong who ruled for 60 years before he abdicated in 1796. He was a great patron of the arts, both “a preserver and a restorer of Chinese culture.” While he himself wrote some 40,000 poems, he still engaged in periodic book-burnings, banning books deemed to be subversive, a list that included some 2,300 titles. 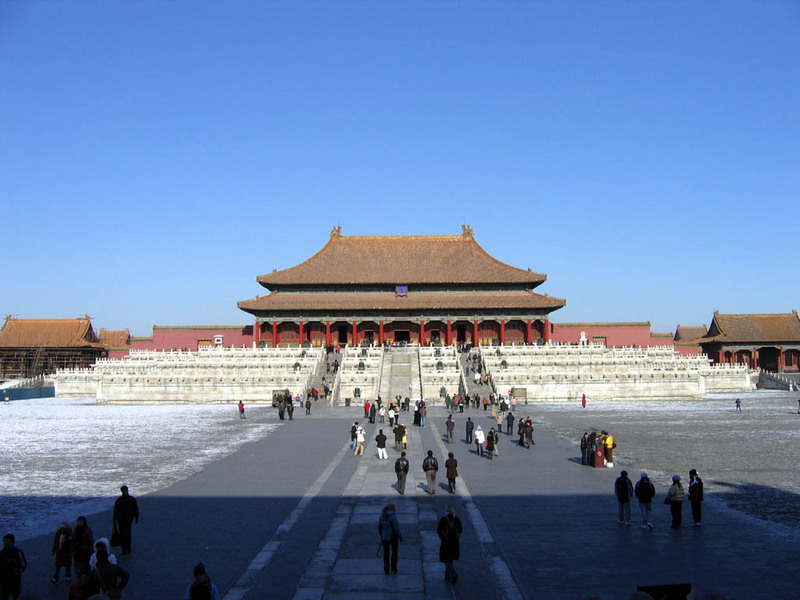 Today, following the demise of its Empire, the rise of the Republic and the revolution that brought about the current Communist state, the Forbidden City remains a museum of Chinese culture, and like Versailles today is a major tourist attraction. 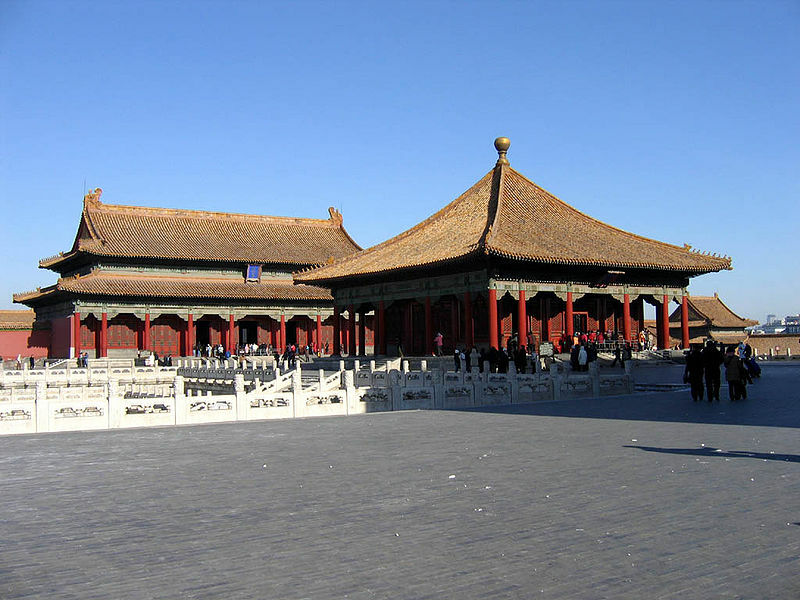 Even though the pageantry of the Imperial Age has passed, the square in front of the City is a major part of Beijing’s public life. 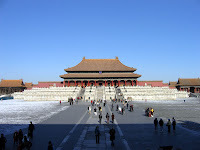 At 109 acres, it is the largest public square in the world, spreading out before the Gate of Heavenly Peace or, in Chinese, Tienanmen. For many Westerners, Tienanmen Square will forever be remembered for the 1989 protest and its ensuing massacre, especially with its iconic image of the young man facing down a line of government tanks. 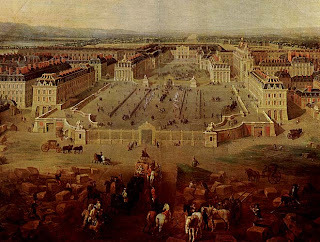 One need only think back to a time when riots in a Paris square in front of the Bastille Prison in 1789 eventually ended the long and illustrious world of many of the kings who’d lived in the rarified world of Versailles. This is a re-blog of a post I'd originally written for the Harrisburg Symphony blog, a follow-up after their performance of Mahler's 5th Symphony looking into the "continuing biography" of the piece between the time Mahler completed its first draft and then conducted its first performance. You can read my earlier post about Mahler's 5th - what was going on in his life when he composed it - here. 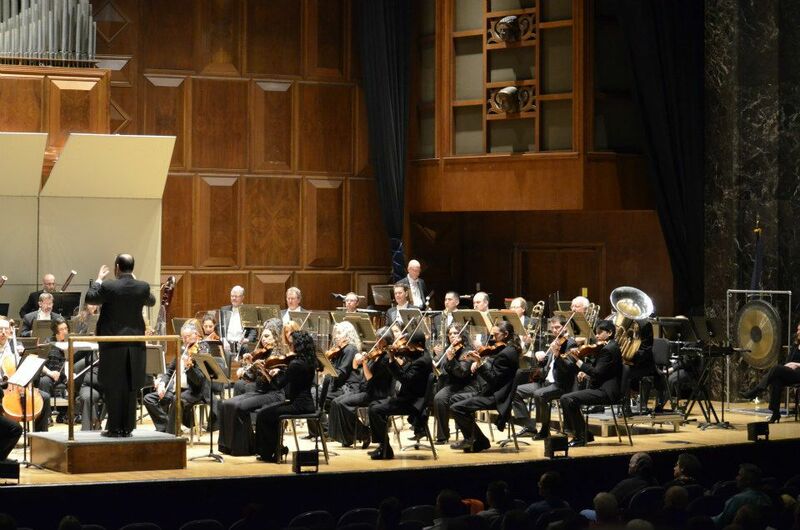 Hopefully, you got a chance to hear the Harrisburg Symphony’s performance of Gustav Mahler’s Symphony No. 5 this weekend – a remarkable performance, I thought (though I’m biased, I can be very picky about certain things, especially Mahler), especially considered the stamina required after a grueling schedule with three rehearsals on Thursday and Friday, a dress rehearsal on Saturday straddling the noon hour, an all-out performance Saturday night and another one on Sunday afternoon. Obsessed as I am with Mahler – which one rarely gets to hear live (and played well, at that) outside the major cities of the world – I sat in at the rehearsals and found myself wondering, “what did musicians do in 1904 when they were faced with such difficult music for the first time?" They would have never heard the piece before or played what today we could consider standard repertoire from the 20th Century like Stravinsky’s Rite of Spring (still TBA in Mahler’s day). What did the audience think? Though me might have fewer "facts" about audience reaction, that leaves us with the critics: what kind of reviews did it get? So once again, I dipped into Henri-Louis de la Grange’s massive Mahler biography – this time, Volume III which, in its 1,000 pages, covers the years 1904 to 1907 (subtitled “Vienna: Triumph and Disillusion”) – to see what I could find out about those early performances. Subsequent performances were rare but one performance in 1903 in Cologne – presumably well performed and more importantly well received by both orchestra and audience – prompted Mahler to consider that city and its orchestra for the premiere of his newest and most difficult symphony yet. Typically, Mahler would read through a new symphony of his with the Vienna Philharmonic where, at the time, he’d been music director. But since his resignation for reasons of health in 1901 following his near-death experience with a massive hemorrhage [see the end of Part I], things had not been going well between him and the orchestra. His resignation had been met with considerable relief on the part of many musicians who considered him too challenging a task-master (they chose as his successor the one least likely to challenge them as much) and there were other managerial issues as well, not the least of which he still conducted the same orchestra when it served as the “pit orchestra” for the Vienna Court Opera (the Imperial equivalent of what is now usually called the Vienna State Opera). Still, his brother-in-law, recently married to his sister Justine, was the orchestra’s concertmaster and he proposed to the committee for such things that Mahler be given two – not one, but two – rehearsals to try out his new 5th Symphony in 1904. The musicians agreed to this – and surprisingly to doing it without a fee – and so Mahler prepared to take the 5th out for a test-run. 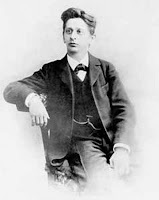 His new publisher, Peters (managed by Henri Hinrichsen at the time), had offered Mahler generous terms for his 5th following the impressive premiere of his 4th and 3rd symphonies (in that order), and they produced a “miniature score” or study score of the piece to help musicians and critics (and potential conductors) become familiar with the piece. 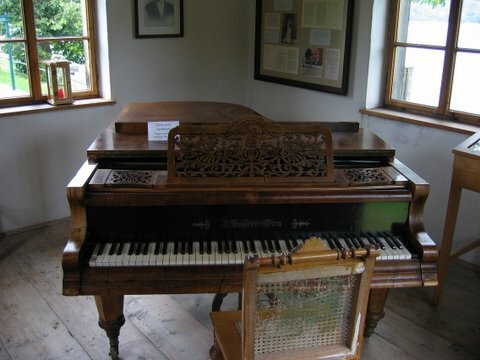 Another standard procedure in such publications was creating a piano reduction – usually for piano duet with two people (four-hands) sharing the bench – which enabled anyone to play through the work, especially helpful given that recording technology did not exist then. One of the people who’d gotten such a score was the composer Josef Förster who had stopped by Mahler’s office at the Opera and, since Mahler was not in at the moment, who sat down to while away the wait by improvising at the piano. He had worked in some bits he remembered from Mahler’s new score when Mahler himself came back and was quite surprised to hear this: after all, it hadn’t been played, yet, not even rehearsed! When Förster explained, they both had a good laugh about it. When the read-through was later scheduled, Mahler sent him an invitation to attend the closed session. La Grange also includes an anecdote about another attendee at that session, the critic Ludwig Karpath (at the time, one of the Viennese critics likely to be in Mahler’s camp: later, they would have a nasty falling-out) who sneaked into the hall and hid himself within the organ console (sitting on a freshly painted step and ruining his jacket in the process). There was another listener in the hall, the young woman whom Mahler had met and married during the months between those two summers spent composing the symphony [see Part III]. Alma Mahler was herself a composer, having studied with Alexander von Zemlinsky (technically, she did more than study with him, but we needn’t go into that, here), and even though she had promised to give up composing when she married Mahler – we needn’t go into that, here, either – she was enough of a musician to be able to assist her husband in copying his draft into the final manuscript to be sent to the publisher. 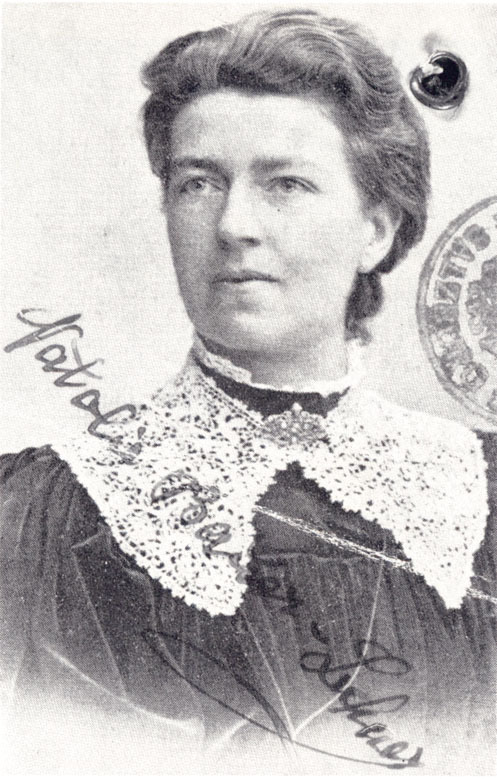 And while she might complain about her lot as a housekeeper and copyist – and, subsequently, as a mother, after their first daughter was born a few months after Mahler finished the symphony – Alma insisted that her primary role was to love and support the genius who could write such music. But she left this one read-through in tears, apparently distraught about the impact of the percussion writing during the opening movement, the funeral procession that is frequently accompanied by bass drum, cymbal, side drum and gong which Alma thought was far too loud and overpowering. She writes that for some time she was sobbing so much she couldn’t explain the problem to her husband: “You have written a symphony for percussion!” But, she continued, he laughed, picked up the score and crossed out most of the side-drum part and half the percussion with a red pencil. Curiously, there’s no indication Mahler ever suggested such changes to the publisher when he revised the score in preparation for its publication, but that’s another story. But yes, even though Mahler was an expert conductor and an experienced performer of his own music – not just an isolated composer writing in the ivory tower of his studio somewhere – he still had reservations about his orchestration skills – in other words, how he wrote for the orchestra. (Having survived a few courses in orchestration over the years, myself, it is more than just making sure you’ve written things within the range-limits of a given instrument – not writing a violin part that would take it below the tuning of the lowest string or taking the English horn too uncomfortably high for its upper register (use a regular oboe, instead, they would advise) – or even written things that are comfortably playable on the instruments in terms of passages that “lie well” for the fingerings of a clarinet or viola, but balancing different instruments so that a background line in the brass doesn’t drown out the woodwinds in the foreground (understanding how dynamics play a role in the way instruments will sound in the hall). Since Mahler’s symphony is full of contrapuntal textures – especially in the scherzo and finale – dynamic markings play a key part in clarifying the dense textures he writes. When the musicians were reading through the individual movements at our recent rehearsals, the texture often sounded muddy and ponderous. But Stuart would go back and fix things, usually saying things like “when Mahler writes piano [soft], play it really piano or even softer: somebody else may have a forte here, but you have to stay down” so as not to cover (or swamp) the other parts. Playing the passage over again, it’s amazing how, suddenly, everything becomes clear and lighter and tends to drag less if it’s a fast passage, especially in all those “scrubbing” passages where the strings play endless eighth-notes under the themes, particularly in the fugal sections in the Finale. Suffice it to say, from the reading session and the impending premiere performance, Mahler was well on his way to constantly making numerous revisions in such details – not just dynamics but also doublings between instruments, sometimes made to strengthen a line that, maybe, doesn’t need strengthening after all – making almost every subsequent performance a “new edition.” He continued to make such revisions to his 5th Symphony until the time he died in 1911, hoping to find a solution to his “orchestration problem,” and as recently as a decade ago, conductors were still trying to come up with a “definitive edition” of the 5th, if such a thing is even possible. Anyway, back to the 5th’s premiere. The question of where the first performance would be given was a big question for the composer and his publisher. It wasn’t a question of doing it in Vienna with his own orchestra because, technically, he didn’t have his own orchestra: he conducted the Opera which only gave symphonic concerts as the Vienna Philharmonic with which he was no longer officially associated. Plus, he had too many enemies, speaking of office politics, between the orchestra’s management and its players to feel he’d get a good performance from them. 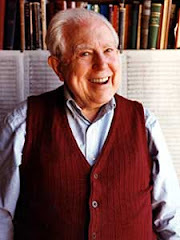 Then there were the critics, most of whom were quite open about their animosity toward him – some of its anti-Semitism having nothing to do with the artistic qualities – not just as an often controversial conductor and director of the Opera but especially as a composer. However, perhaps there was a thaw that Mahler felt during the summer of 1904 while he was finishing up his newest symphony, the 6th. The possibility of a Vienna premiere was encouraging: they had agreed to perform the 3rd in Vienna, so that might bode well for the 5th’s reception. On that account, Peters prepared the miniature score and Mahler had the proofs returned to the publisher at the end of July. Interestingly, Mahler tells the publisher he does not want the symphony’s tonality to appear on the title page: it is not to be the “Symphony No. 5 in C-sharp Minor” but just the “Symphony No. 5.” Mahler’s concept of a “progressive tonality” that might begin in one key and resolve, ultimately, to another, was not the issue. He said, “normally the key of the main movement” is the key of the symphony, but here “the main movement (A minor) is preceded by another.” Which means the first movement’s Funeral March in C-sharp Minor is structurally an introduction to the 2nd movement which is in A Minor. I find that fascinating, because we normally think the beginning of a piece is its primary tonal statement – Beethoven’s Symphony No. 5 in C Minor, for instance – but here, he must view the beginning as more like a prelude, perhaps, a curtain-raiser of sorts: is the second movement really the main argument of the piece? In the past, considering how similar the first two movements are, I had always assumed the Funeral March was like a sonata-form’s exposition and that the second movement was more of an extension of it or a slightly different view of it (both are certainly full of tension and outright anxiety, even though the 2nd is marked “violently agitated with the greatest vehemence” which is not, technically speaking, a tempo indication), perhaps even the equivalent of a development section. We know that when Mahler finished his work that first summer, he had completed the Scherzo first and that what were the first two movements was still one unbroken movement: later, for some reason (and however he chose to do it, we don’t know) he would turn this opening movement into two separate movements. Another reason I think this happened after that first summer’s work is that his friend Natalie Bauer-Lechner, who acted as a kind of companion and house-guest (without the prurient innuendos that might suggest) as well as musical confidant, wrote nothing about the reason he did that – at least, not as far as I can tell. He told Natalie maybe not everything but a lot about his creative process – we owe much of what we know about the birth of his three earlier symphonies to her jotting down practically everything Mahler said or did. Whether he told them to Alma as well – who, like Natalie, a violinist, was musically knowledgeable and intelligent as well - but Alma didn’t seem to make note of these statements: and many of the things she notes in her diaries often conflict with what she later wrote in her memoirs or seem to go against versions of stories that other people tell. And, if you read some of her diary entries from the first summer in 1902 living with Mahler as his wife, she seems more interested in focusing on her thoughts, her problems and her issues than on Mahler’s – unless they’re in relationship to hers. Anyway, back to the premiere of the 5th (sorry, I keep saying that…). Given he would conduct his 3rd in Cologne over Easter, it was decided the honor of the premiere should go there but not for its summer music festival as suggested (too soon). It was agreed, ultimately, the world premiere of his 5th Symphony would take place in October at the Gürzenich Orchestra’s opening concert of the 1904-1905 Season. The Gürzenich, btw, is the city’s main orchestra, named (like the Concertgebouw in Amsterdam or the Gewandhaus in Leizpig) after its concert hall. Now, in 1902, Germany had passed a new copyright law that ensured a composer’s works were under copyright protection for 30 years after the composer’s death and was also to include all previous works as well. With this in mind, Richard Strauss was instrumental in creating the the Association of German Composers whose subsidiary branch, the Agency for Performing Rights, kept records of works that were performed, collected royalties and charged “a small commission” to cover their expenses from any orchestra or opera house performing copyrighted works. Many composers rebelled at this since such additional fees would discourage many organizations from scheduling their works. But there was also some bureaucratic conflict with a comparable Austrian society to which Mahler already belonged, so he allowed that membership to expire, urged on by his friend Strauss (who was an astute businessman as well) to join the Berlin society. Mahler, always lacking such business acumen, let a friend of his represent him in this matter which became more complicated than it’s worth going into here. Suffice it to say, this conflict had an impact on where in Germany Mahler could get his premiere scheduled! Meanwhile, in early July, the arranger assigned the responsibility of creating the piano reduction of Mahler’s 5th complained to the publisher about the changes Mahler insisted on making. Transcribing such a dense orchestral texture to a single piano, especially for an arranger unaware of the musical overview, was challenging enough and Mahler found many instances where major foreground material was being overshadowed or even overlooked by the background textures the arranger assumed were more significant (or perhaps fun to play). To us, this would sound like so much dog-wagging by a tail who’s had its feelings hurt. But it is just another of the nit-picking details Mahler the composer had to contend with in the process of preparing his own work so Mahler the conductor could perform it! And so October and the impending Cologne premiere drew near. As late as September 28th, Mahler was still sending corrections to Peters regarding changes in the score and the orchestral parts. He was also lobbying to replace the regular conductor for a subsequent performance of the 5th in Munich, a conductor Mahler felt had given bad performances of other works of his (particularly the 3rd only a few months earlier), with his own young assistant, Bruno Walter (who, in later years, would become one of the major conductors of his generation and who performed and recorded much of Mahler’s music during his own lifetime). Walter had even agreed to conduct the performance for only his travelling expenses, but this performance was eventually cancelled due to the on-going conflict with the Association of German Composers. 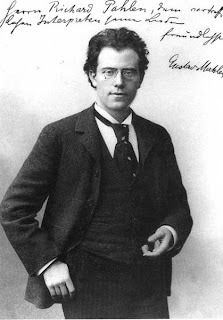 In preparation for the actual performance, Mahler was scheduled to leave with Alma accompanying him – after all, she had helped him copy the score – but she had recently given birth to their second daughter Anna (“Gücki” by nickname) who was still nursing. If that weren’t enough, Alma herself had fallen ill and had to stay in bed, arranging to meet Mahler in Cologne by later train in time for the dress rehearsal. Though bad news for the happy couple, now married for a little over two years and parents of two girls, it gives us some of Mahler’s insights into the rehearsals in the letters he wrote home, joking about how preferable it would be to be a cobbler (quoting an aria from Lortzing’s then well-known opera “Tsar and Carpenter”) which he proceeded to vary in the course of his distressing reports, to be, say, an inn-keeper who became a baritone (referring to a singer on the Opera’s roster) instead of a composer and so on. He complained that the “Scherzo is a devil” to perform and wished he could give the premiere of this work fifty years after his death instead when, hopefully, orchestras might be more up to the challenge of playing it. He looked forward to her arrival in a few days so there would be at least one person there who would understand his music. Unfortunately, her cold was only worse and she might not be able to make it until the performance. The second rehearsal, he reported, went better and that, importantly, the orchestra was growing in enthusiasm for it. But now it turned Alma would not be able to make it at all. Still, the dress rehearsal went well except for a few cat-calls from the audience after the devilish Scherzo, but in general and ultimately the audience was enthusiastic. Hinrichsen, his publisher, was confident enough to ask to publish his newly completed 6th Symphony – a good sign! Curiously, at least as we think of concert programing today, the concert opened with Mahler’s 5th and then was followed by Schubert’s Serenade for Alto and women’s chorus (D.920) and three Schubert songs (I’m assuming with piano as was often the case in 19th Century concerts) before ending with Beethoven’s Leonore Overture No. 3. Brief but generally hostile reviews would appear in the Berlin and Leipzig papers. The next afternoon, Mahler was on the train for Amsterdam where he was to conduct the 2nd Symphony as the guest of Mengelberg with the Concertgebouw. He had also suggested programming the 5th but Mengelberg felt perhaps the Dutch audience wasn’t ready for this one yet, and suggested doing the 4th instead (still new) which they ended up performing twice on the same program. One of the friends he spent some with, then, was the poet Richard Dehmels – best known to music lovers for having written the poem, Verklärte Nacht (“Transfigured Night”) set to music by Arnold Schoenberg in 1899. 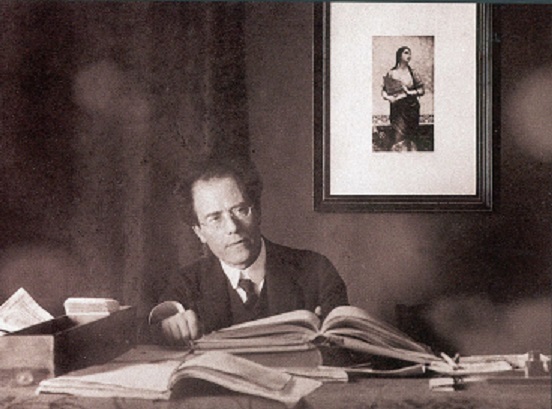 At a dinner, one night, Mahler complained of the stress touring had on him but which he needed to do in order to earn some money after his salary had been reduced at the Opera (though much of that would seem to be the result of a reduced performing schedule rather than a cut in pay). “I am really curious to know if the performance of my works will ever bring me a penny.” But another reason he took on guest conducting “gigs” was to present to the world a reliable performance legacy since he had to find out – especially with the 5th – if the problem with its acceptance was the work or the conductor. Recent performances in Berlin and Prague had made only negative impressions – critics aside – and only he could correct that. Curiously, Mahler received some encouragement from America where his 5th Symphony became the first of his works to be performed in the United States. The Cincinnati Symphony presented it in May, 1905, not quite a year after its premiere, and it was well received by most of the critics. For the Cincinnati Enquirer’s critic, the work was not difficult to understand: “despite all this expansion, there is no complexity and the intentions of the composer are clear.” The Commercial Tribune pronounced it “the most impressive and meritorious novelty” the orchestra had yet presented. Of course, it might be difficult, over a century later, to imagine what this music would have sounded like to people who’d never heard Pierrot Lunaire or the Rite of Spring or for that matter even some of the film scores that go barely noticed today despite how they could be perceived independently of the film. Still, there are people today who find Mahler “not my cup of tea,” as one listener explained to a friend at Saturday’s concert, or those who may be uncomfortable with his over-the-top expression like a chaotic jumble of untold anxieties – the left-brained individual at ease with order and predictability would not be at home in Mahler’s right-brained world – and after all it did take a long time for Mahler to “find” his audience. 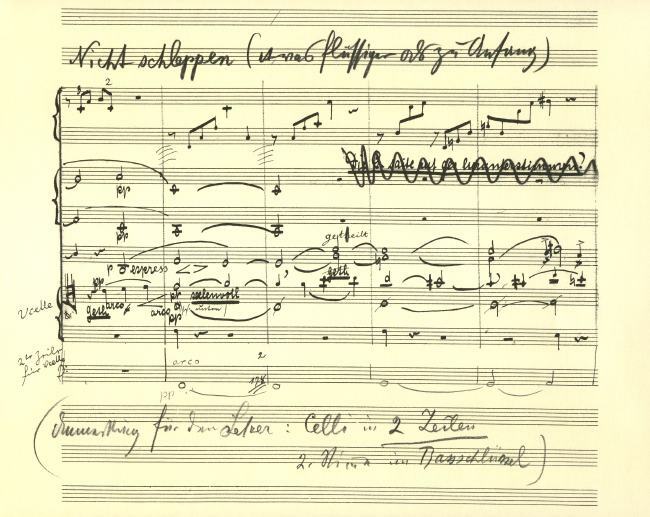 It is interesting to note, considering the constant revisions Mahler was making with each new performance, that he was still making slight changes and adjustments (mostly to dynamics and other markings) to the 5th Symphony's score even at the time of his death in 1911. His publisher, annoyed at all this and complaining how the work had cost him enough money already, had told Arnold Schoenberg whose Five Pieces for Orchestra he was preparing to publish in 1912, he was "planning to melt down the plates of the Fifth Symphony since it was falling into obscurity." The comment he’d made to Alma about wishing he could premiere his symphonies fifty years after his death proved telling. It was during his centennial anniversary in 1960 – almost 50 years after his death – that Leonard Bernstein played all of Mahler’s symphonies with the New York Philharmonic, introducing much of the world to a composer whose time may finally have come. These days, it's hard to imagine a figure like Mahler with these epic symphonies were ever "neglected." I had to remind myself that most of the audience - not just the young people - for his 1960 Young People’s Concert “Who Is Mahler?” would have ever heard a complete Mahler symphony in concert. 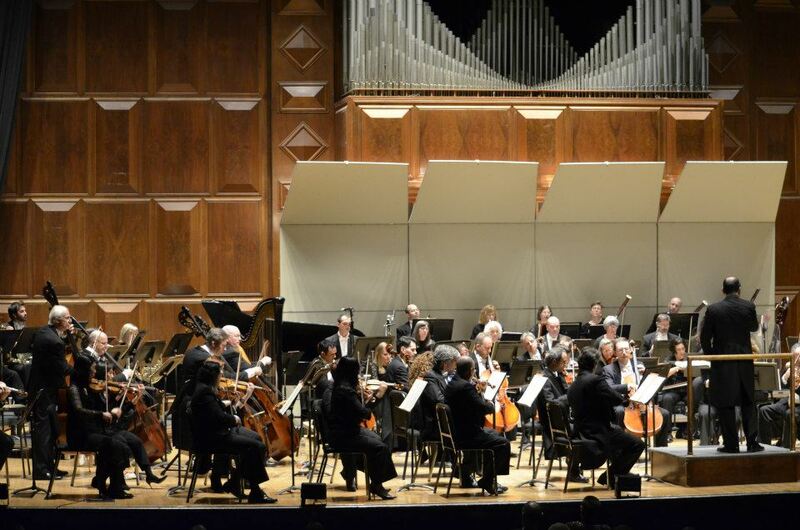 This program was all part of the plan to bring Mahler’s music to a wider audience. Now, most orchestras will program the first two, more readily accessible symphonies often enough and any concert with the later works becomes something of an “event” – as did the performances of Mahler’s 9th and 3rd here in Harrisburg in previous seasons and the 5th (which was better attended than I would have thought) and cheered soundly by an enthusiastic audience at its conclusion. It all takes familiarity and a willingness to engage oneself actively – not to mention a certain kind of stamina, admittedly – but in the end, I think many people are discovering that Mahler speaks to us or our time today. The photograph of the Harrisburg Symphony playing Mahler's 5th was taken on Sunday afternoon by Kim Isenhour, the orchestra's marketing director and photographer extraordinaire, originally posted on Facebook. 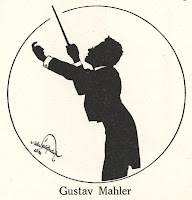 This series of posts on Gustav Mahler's 5th Symphony was originally posted on the blog I maintain for the Harrisburg Symphony where I often go "behind the scenes" about the music on up-coming programs. Being one of my favorites and one of those epic symphonies that one could write so much about, I chose to write primarily a "biography" of the work: what was going on in the composer's life at the time he was writing it. So I'm re-posting it here, slightly edited, on my original blog to keep it part of the on-going series, here, which I tag "Up Close and Personal." One day, a leading critic in Vienna complained over lunch to conductor Gustav Mahler, director of the Imperial Opera and the Vienna Philharmonic, about not only his obsession with the music of Richard Wagner but his unbounded enthusiasm for it which, he thought, was like the foie gras they were dining on at the Café Imperial. To anyone thinking Mahler is obsessed with death – and certainly his last two symphonies were written when he knew he was dying – the fact the 5th Symphony opens with a funeral march may seem daunting. On the other hand, considering where this token of death leads us, it is not something we haven't experienced before: there are famous funeral marches in earlier works like Beethoven’s Eroica or Chopin’s B-flat Minor Piano Sonata, much less Mahler’s own 1st Symphony with its odd minor-mode version of Frere Jacques. However, it seems odd to start a heroic symphony – which in essence it seems to be – with the death of the hero. Where do you go from there? Before he began work on this new symphony in the summer of 1901, perhaps before he had even planned anything about the new symphony he would no doubt write next, there was an experience that no doubt had a profound impact on a composer who’d turned 40 the previous summer. It was over Christmas, 1900, that he was preparing the final copy of his 4th Symphony to send to his publisher. There was an idea that he changed in the scherzo which has this violin solo he now felt should be played on an instrument with its strings tuned a step higher than normal, so that “it will have a harsh, shrill sound, as though Death were playing it.” This, in the middle of a symphony that ends with a rapturous and child-like evocation of a Heavenly Banquet! After the holidays, back to business as usual, Mahler was preparing for a new production of Wagner’s first successful and rarely performed opera, Rienzi when a recurring throat infection was diagnosed as tonsillitis. He monitored the dress rehearsal from his bed via telephone, but felt well enough to conduct the opening night performance. A few days later, on January 27th, and not yet recovered, he conducted Beethoven’s 9th Symphony. Shortly afterward, he received word of the death of Giuseppe Verdi who’d died on the 27th at the age of 89. Verdi was a composer for whom Mahler felt an “almost affectionate veneration.” Friends remarked he seemed very affected by this news. He was surprised by how well it had stood up, considering his musical style had developed considerably over the time in between. The general response from the audience was genuinely enthusiastic, though the critics (as ever with Mahler) were often derogatory. Many of them were conflicted, trying to separate Mahler the Conductor from Mahler the Composer. On February 24th, he conducted the Bruckner at a 12:30 concert and then conducted Mozart’s Magic Flute at the opera that evening. That same night, Mahler suffered a hemorrhage – not the first he’d had, but the most violent – in which, he later told Richard Strauss, he’d lost 2.5 liters of blood. His sister found him lying in a pool of blood, called the doctor who felt obliged to call a surgeon. Had they arrived a half hour later, the doctor told him, it would’ve been too late. That same day, he was examining the proofs of his 4th Symphony which the publisher had ready for him and was horrified to realize the copyist had marked the slow movement (which acts as a transition into the finale) in second place, followed by the Scherzo with its Death’s Fiddle solo. And that, you might assume, is why Mahler began his next symphony with a Funeral March. At the end of the opera season in June, 1901, Gustav Mahler – no longer conductor of the Vienna Philharmonic but still director and chief conductor of the Court Opera in the Imperial capital – was able to leave the busy schedule and the constant in-fighting (not just office politics but dealing with opera singers’ egos) and head out to his new dream-home, built with the money he was finally making as a busy conductor, both in Vienna and across Europe. Today, we think of Mahler as a famous composer but in his day he was a famous (if not always respected) conductor and as a result, the schedule of overseeing the business of running the opera house, planning its new productions, handling singers’ schedules not to mention dealing with an imperial bureaucracy that would put Washington to shame as well as conducting many of the performances – and don’t forget the occasional guest conducting opportunities outside Vienna – left him very little time for composing. He became, in self-defense, a “summer composer.” This was not uncommon: even Brahms, who had no such professional demands on his time, found himself only ever able to compose during the summers, spending time in Vienna with all its distractions working on final drafts and orchestrations or proofing manuscripts and printer’s galleys. Then when summer arrived, like Brahms, Mahler would take off for some place in the Austrian mountains – occasionally Northern Italy – where he would find the solitude to work on new compositions. And like Brahms, he would rent rooms or houses where he could (hopefully) enjoy the peace and quiet around him – walks in nature or pleasant places to hang out without being himself a tourist attraction. He might have favorite places to go until something happened or he simply sought new locations. Some were more successful than others. 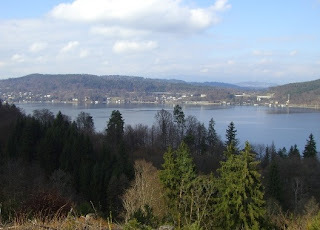 Unlike Brahms, Mahler eventually decided to buy a property – this one on a lake near the Carinthian town of Meiernigg – where he built a house which friends would later call “Villa Mahler.” This lake – the Wörthersee, a rather sizeable one for land-locked Austria – had a climate that made it the equivalent of a Mediterranean vacation destination and in the summer of 1899 he, his sister Justine (whom everybody called Justi) and his friend Natalie Bauer-Lechner toured the place looking for a place to stay when Mahler found a rocky promontory overlooking the lake where he thought he could build a house. 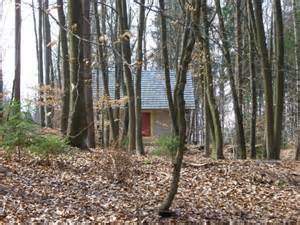 First, however, the architect agreed to build a small house – a composing hut – for the composer, a place off in the woods not far from where the house was to be built: the hut would be ready for the following summer. That summer, he rented a villa that was a 20-minute walk from his hut where he “savored peace, security and Dionysic wonder, keeping the windows open to breathe the pure forest air” rather than, as usual, keeping them closed against noise (as he had to do in Vienna and several other summer properties he’d rented). It was here, that summer, that he completed his Symphony No. 4. June 1901 would be his first arrival there as a property-owner. The house had been finished – an old-fashioned cross between a lakeside villa and mountain chalet with three floors and a basement that opened onto the lake-shore – with a steep foot-path that linked the main house to the all-important composing shed where Mahler would spend several hours a day. But Mahler, despite having given up his duties at the Philharmonic following his near-death experience in February (see previous post), could not concentrate on composing – at least, not at first. He set about studying scores, primarily the polyphonic motets by Bach and songs by Schumann. In the course of the summer, he would write several songs for voice with orchestra: several poems by Rückert – he composed, appropriately, “Ich atmet’ einen Lindenduft” (“I breathe a sweet scent”) in the first days after his arrival – and one from the collection of folk poetry called Des Knaben Wunderhorn (“The Youth’s Magic Horn”). The fact he could not get a “larger project” underway bothered him. So he decided he would just put aside two weeks and rest. Naturally, he immediately began jotting down new ideas. Even when he went for walks, he would take small notebooks with him to scribble down a few pitches here and there that would generate a theme. But for a while, he told no one what he was working on. It’s possible he might not be sure what it was himself, at least to begin: he was always reluctant to play through anything for his friends that he was still composing until the first draft was finished. Five days later, he invited Natalie to the Composing Hut and played for her this collection of songs he had been working on (one more would be finished the next day, the famous “Ich bin der Welt abhanden gekommen” (“I have become lost in the world”) usually collected in a set of Rückert-Lieder that includes “Um Mitternacht,” also composed that same summer. Before he left for Vienna, he gave her the songs’ original manuscripts. Whatever he had planned – he also said it would contain “no harp or English horn” nor a human voice as his last two symphonies had – it was not yet finalized: though lacking voices, it did include both harp and English horn; and while it may originally have been four movements, at some point he decided to break the first movement into two – the opening Funeral March followed by an allegro marked “strürmisch bewegt” (highly agitated) and “mit grosser Vehemenz” (with great vehemence). But this life-affirming scherzo is the first music he began composing – or, whether he’d sketched anything beyond an idea of the opening movement, at least the first movement he completed – for his new 5th Symphony. 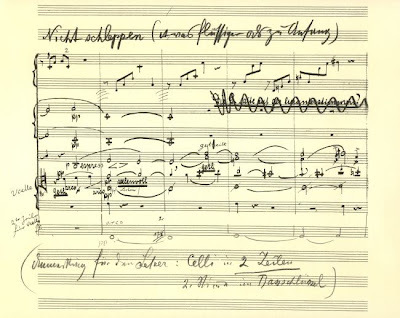 Though it's difficult to say when Mahler sketched what or composed which movements during this particular summer, he had, apparently, written what would become the first two movements of the symphony as it now stands. Presumably, they were conceived as one single movement which at some point (ostensibly the following summer) he broke in two. There seems to be no indication that I can find concerning how he did this, perhaps the opposite of what Sibelius did in his own 5th Symphony in 1915 when he decided to combine his opening movement with its ensuing scherzo to create one single but not necessarily unified movement. This would explain, of course, the amount of shared material - particularly the rhythmic cell from the opening trumpet fanfare that pervades both movements in one form or another - almost as if the second movement was commentary on the first or perhaps the deferred development section to the opening's exposition (speaking, of course, only conjecturally). It stands outside the standard convention of Sonata Form Opening, Slow Movement, Scherzo and Finale format of the 19th Century Symphony, to become the "added fifth" movement the way Beethoven's thunderstorm was inserted between the Scherzo and the Finale of his 6th Symphony, the Pastorale. The summer was not without its occasional interruptions: tourists gliding past on their boats (Mahler himself owned two boats) might either shout at him how they hated his music (“what has he ever done to you,” one shouted at the friend who then responded, “he wrote a terrible symphony and then another one!”); or glimpsing him on his balcony, cheering him with bravos. Characteristically, he found both of these distasteful and rushed inside to avoid acknowledging either. One night, after a long walk and a late-night conversation on the balcony with Natalie, Mahler was disturbed by the sound of a man falling in the water. Rushing barefoot down the steps, Mahler was able to reach the man in time and drag him to shore, though the man, clearly drunk, was so frantic he nearly drowned Mahler along with him! Cries for help brought others and eventually the man was rescued and given blankets and dry clothes before he left without ever giving them his name. 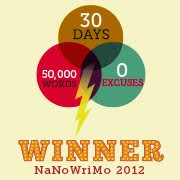 Otherwise, it was an idyllic time – serene was the way he described it – and very productive despite its slow start. In all, he composed eight songs (with orchestral accompaniment) and what became three movements of his new symphony. Yet, despite the mood of the scherzo, everything else was “funereal,” meditations on death and dying or on saying farewell to the world. Three of the songs later became part of the cycle known under the gruesome title Kindertotenlieder (“Songs on the Death of Children”). He had expressed to Natalie – perhaps on the night of the near-drowning man – his desire to have children of his own, that he was tired of being lonely and that having children would be his way of “staking claim to immortality.” In writing these songs, it is important to realize Mahler was not yet married nor had any children of his own, but he had lost several brothers and sisters and so, while composing them, he imagined his father grieving for the death of so many of his own children – by 1895, Mahler had lost 10 of his 13 brothers and sisters, 8 of them while they were still children. Mahler’s “entourage,” such as it was, consisted of his sister Justi and occasionally her fiancé, the violinist Arnold Rosé (they would be married the following summer – incidentally, another sister, Emma, had married Arnold’s younger brother, the cellist Eduard Rosé); and their friend Natalie Bauer-Lechner who was a violinist and a member of an all-female string quartet (quite rare in those days). She accompanied Mahler on many of these summer excursions and though some people did not care for her or her morals – particularly one friend of Mahler’s whose husband had been an ex-lover of Natalie’s – she was that rare intellectual, musically knowledgeable friend that Mahler could confide in, musically. 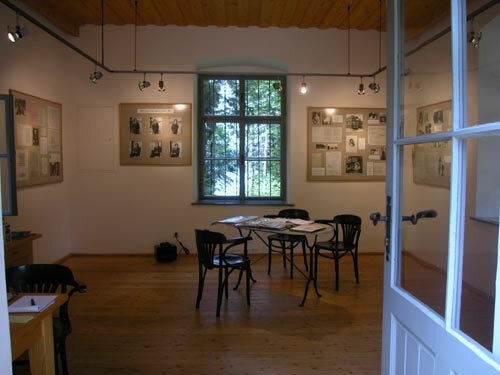 Regardless of what the future would bring, her journals (some published; others, not) became important sources for future biographers of Mahler, especially concerning his creative insights into the works he composed during the summer she spent in his proximity. 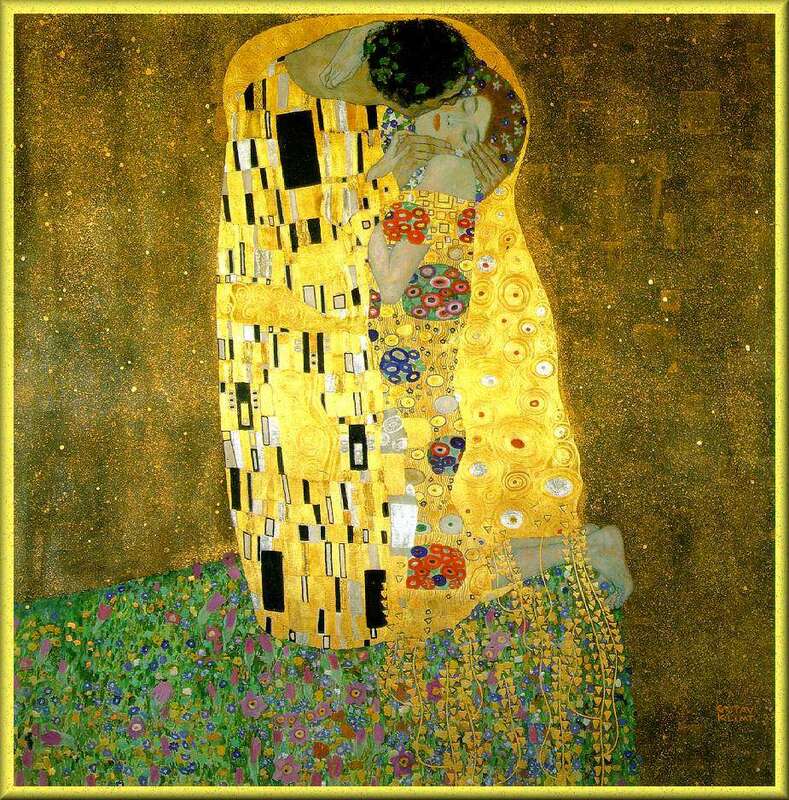 It is also important to realize – our modern morality aside – that she and Mahler were never lovers. 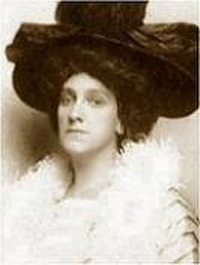 Mahler had his affairs and one of them was an unfortunately convoluted relationship with one of his opera singers, Anna von Mildenburg, which he had tried to break off several times (a native of the region, she had helped him locate the land where he built his villa, but she was not a guest at the house). Natalie, by her own account, only ever loved two men in her life – the poet Siegfried Lipiner (who, a friend of Mahler’s, had written the poem that formed the initial basis of Mahler’s 3rd Symphony and who, incidentally, was now having an affair with Mildenburg himself) and Gustav Mahler who, at least romantically, seemed totally unaware of Natalie’s feelings, despite some of the confidences he made to her, especially the one about wanting to get married and have children. At any rate, the summer came to an end and on August 26th Mahler packed up and left for Vienna, Justi and Natalie staying behind to close up the villa. Mahler had just written to Henrietta Mankiewicz, a mutual friend of his and Natalie’s, “What a good thing it is for mothers that they do not have to interrupt the process of giving birth – for the babies, too, perhaps.” His new symphony would have to wait until the following summer to be completed. The details of this sad and clearly uncomfortable confrontation, so soon after this serene summer, may not be totally reliable, Mahler’s biographer Henry-Louis de la Grange adds, because it was included years later in the memoirs of a woman who would later have a vested interest in the life of Gustav Mahler. When Mahler returned to Vienna after that busy summer of 1901, arriving back at the "quagmire" (as he called it) of the opera house's constant in-fighting, he had finished what would be the first three movements of his new symphony, his Fifth. Initially, the idea had been it would be a “normal” symphony in four movements without the human voice and, presumably, without a “program” or story behind it. Mahler had supplied fairly detailed stories for the first three symphonies – either what had inspired the music or what the music meant in terms of a story. He had chosen texts for vocal soloists or chorus that implied a layer of meaning as well and had even incorporated songs he had written even if he, here, omitted the voice and text (for instance the song about St. Anthony’s sermon to the fishes for the scherzo of his 2nd Symphony). In his 3rd Symphony, which underwent frequent changes from the initial sketches to its final format when he completed it in 1896, he had supplied numerous possibilities, given each movement descriptive subtitles and then removed them. Having dinner with friends in October 1900, he declared “Down with programmes which are always misinterpreted!” Yet in December 1901 he sent the orchestra in Dresden a detailed program for a performance of his 2nd Symphony (the “Resurrection,” which incidentally has nothing to do with Easter) merely as a means to help the audience contend with something new and challenging as well as unusually long. Mahler had conceived the 4th originally as a suite of songs (vocal or not), six movements in all, and the whole would be called “Symphony No. 4 (Humoresque).” The ultimate scherzo for the 4th – with its image of fiddling Death (and what’s that about, people would ask) – didn’t exist in that initial version but the D Major scherzo that did, in the best waste-not/want-not manner many composers (even Beethoven) would not think twice about, found its way into the 5th, where it became the germ of his third movement. Whatever programmatic implications it might have had there were no doubt officially shed. Certainly the 5th’s scherzo continues the kind of joie de vivre that marks so much of the 4th Symphony. By the time he’d begun the 5th in the summer of 1901, months after his near-fatal hemorrhage – though it opened with its Funeral March and subsequent emotional storm, he completed the Scherzo first – Mahler was quite reticent about the “meaning” behind the music beyond what he’d already told Natalie about the scherzo – the man in “the full light of day who had reached the climax of his life.” More often, he talked about its contrapuntal complexity – he became obsessed with polyphony after studying Bach, especially the motets, and was now criticizing Tchaikovsky, for instance, for not using it in his symphonies. Interrupted by his return to Vienna at the end of August and resuming his duties as director of the Vienna Opera, he put aside work on the new 5th Symphony and prepared for the premiere of his 4th, set to take place in mid-November in Munich. It was his first premiere since the 2nd was first heard in 1895. The 3rd, which he’d completed in 1896, had yet to be performed: its difficulties were too considerable for it to be taken lightly and he found no opportunities to schedule its premiere. That, too, would take up some of his busy schedule at the Opera: the premiere of the 3rd would finally take place in June of 1902, just before he would return to Meiernigg and his little Composing Hut to resume work on the so-far incomplete 5th. 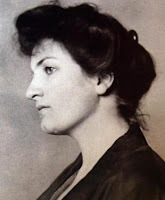 Barely ten weeks after that unfortunate scene with Natalie Bauer-Lechner which ended their long (and for us, informative) friendship, Mahler attended a friend's dinner party where sitting across from him was a young woman whose name, he learned, was Alma Schindler. The daughter and step-daughter of artists, she was young – 22 to his 41 – intelligent and beautiful, had a mind of her own and he was immediately fascinated by her. On December 23rd, they became engaged and planned their wedding for mid-February, though it eventually didn’t take place until March 9th, four months after they’d met. When she and Mahler first met, Alma was still in love with her composition teacher, Alexander von Zemlinsky – a composer Mahler already had mixed feelings about professionally as it was – and with whom, she confided to her diary, she planned on living with and bearing his children. She also found herself the object of other would-be suitors during these months: in one week, she had received two proposals of marriage from men who didn’t interest her in the least. 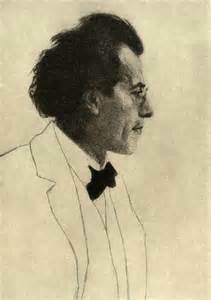 Her mother and step-father, the artist Carl Moll, thought Mahler a bad match – Moll had heard rumors about Mahler’s “womanizing,” apparently seducing every young woman in the opera company – given his age, his debts and ill-health and his “precarious” position at the Opera. A close friend of hers considered Mahler “a degenerate Jew” (despite his necessary conversion to the state’s official Catholicism) who was “not good-looking and his music is apparently not worth much.” What, he asked her, would she do if Mahler proposed to her? “I would accept!” she replied at once. There were times of separation during this courtship and a vast amount of letters passed between them as Mahler went to Munich to conduct the premiere of the 4th and later for another performance in Berlin. There was also much soul-searching. Mahler was concerned not only about their age-difference, but the fact he was from humble origins and she was “born to joy and plenty” with no dark past. She was brought up to discuss the philosophy of Nietzsche and Schopenhauer and she couldn’t share his enthusiasm for the Russian novelist, Dostoyevsky. Mahler, she realized, was a man of genius, ardent and over-flowing with love, but an authoritarian (not just as a conductor), very demanding but a prisoner of himself and his ideals. Alma was described as a “coquette” by some friends, with a “capricious temperament,” conceited and flighty, frivolous but attractive, witty, spontaneous – and, importantly for a composer like Mahler, musical. 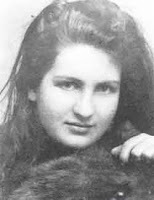 Her mother was determined to convince Alma to break up with Mahler, but given Alma’s complete dislike of her mother (her father’s death had devastated her and she only grew colder toward her disapproving mother) this only strengthened her resolve. When Mahler returned from Berlin and Dresden, writing immensely long letters about his love and happiness, he came to visit the family and, on December 23rd, he asked for Alma’s hand in marriage. By the time the New Year began – and with it, the rehearsals for the Vienna Philharmonic’s performance of the 4th Symphony – Alma was constantly at his side. The inevitable scrutiny from a curious (and often hostile) public annoyed her. Glances and waves to old friends in the audiences were reported to Mahler as evidence of her flirting behind his back. Rehearsals with the Philharmonic were going badly. It was the first time Mahler conducted them as the Philharmonic since his well-received resignation the previous year, but it was the same orchestra he conducted regularly at the opera: personnel decisions he had made there rankled the Philharmonic, where he didn’t have the director’s authority – he was a guest conductor, and they treated him with hostility. Mahler stamped his feet, glowered and raged at the players, finding fault with nearly everyone (this was in the day when maestros were considered tyrants and presumably expected to get away with such behavior: this would never work, today). For their part, the players threatened to walk out of rehearsals. And Alma was there to help calm him down. The 1st Symphony was scheduled for a performance a week later but Mahler decided to schedule the 4th again instead, along with his earlier work, Das klagende Lied. The soprano soloist in the latter was Mahler’s ex-mistress, Anna von Mildenburg, which, given the attention Alma was receiving in the audience, must have been fraught with melodramatic potential! Mahler also received a letter from Richard Strauss with whom he had an on-again/off-again friendship, congratulating him (ironically) on the “St. Vitus Dance” the Berlin critics pulled in their attacks on his 4th Symphony, there, as he prepared to be in Vienna for the local premiere of his own latest opera. Initially postponed from February because Justi wanted it to coincide with her own wedding to the orchestra’s concertmaster, Arnold Rosé, Gustav and Alma’s wedding was eventually held on March 9th – having been scheduled for the 8th, it was discovered the wrong date had been engraved on the ring, so it was moved back a day. These delays no doubt caused concern on the happy couple if for no other reason than Alma was already pregnant and dealing with frequent bouts of sickness. The wedding meal with the two families was calm with long periods of silence. Then Gustav and Alma got on a train for St. Petersburg, Russia, for their honeymoon. The next day, Mahler’s sister and Rosé were married. In Petersburg, the happy couple visited the Hermitage Museum and hoped to attend the opera, but it was closed for Lent. They took a sleigh-ride on the frozen River Neva during which they both caught cold. It was not, however, simply a honeymoon. It had been added to a pre-arranged concert tour: he led three concerts there (none of his music had been programed) and Alma watched the first from backstage, noticing the intensity of her husband’s face which she thought “divinely beautiful.” The final concert was to include Bruckner’s 4th but when told that Bruckner did not go over well with Russian audiences, he substituted Haydn’s “Drumroll” Symphony instead – played with 102 musicians on stage! As soon as the concert was over, the Mahlers were on the train back to Vienna, tired of Russia, its weather and its food, but with enough money in his pocket to help with his outstanding debts. 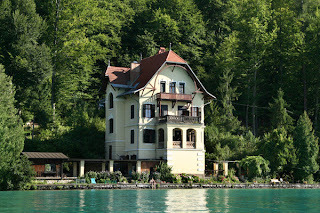 But it did not erase them – there was still the expense of having built his summer home in Meiernigg – and so Alma had to set up house on a thrifty budget. Their apartment was small so when Mahler’s meddlesome neighbor moved out (the one who hated Mahler’s music and always ordered his servant to play the gramophone quite loudly whenever he’d hear Mahler begin to work at the piano), he took over these rooms as well. Then came performances of Wagner operas, the famous (or infamous) Beethoven Exhibit by the group of artists known as The Secession (Alma’s step-father was a member, as were Klimt and the sculptor Max Klinger whose statue of Beethoven caused such a controversy though today the name is more likely to be confused with a character from the TV series “M*A*S*H”) with Mahler conducting Beethoven’s 9th at its opening – and, in June, the long-delayed premiere of his 3rd Symphony. Considering the complexity of the 3rd compared to the simplicity of the 4th which was so universally criticized, the 3rd proved to be a triumph. In fact, the publishing firm Peters was so interested in this symphony, they signed a generous contract with him for his next symphony with far more favorable terms than any Mahler had previously received. After a couple weeks of business at the Opera, Mahler and his wife took off for “Villa Mahler.” Inspired by this most recent triumph – not to mention his new bride and the impending child already on its way – Mahler looked forward to concentrating all his creative energy on completing his 5th Symphony. 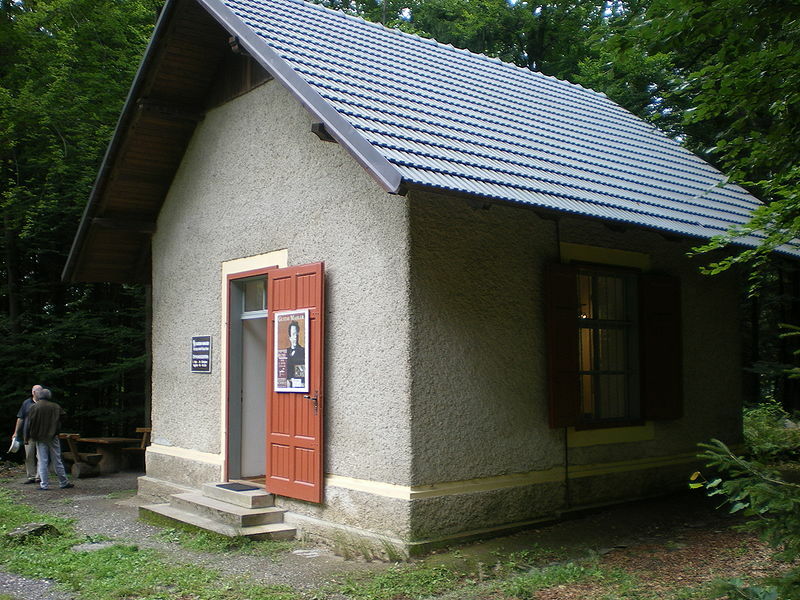 They soon settled into a routine: Mahler would get up at 6, have breakfast (café au lait, diet bread with butter and jam) which he would eat in his Composing Hut. It was Alma’s job to see that no sound disturbed him at the hut – she even had to stop playing the piano in the house because he could hear it from his hide-out in the nearby woods. She promised opera tickets to their neighbors to entice them to lock up their dogs during the morning hours. Built on a natural terrace some 200 feet above the house, the hut had no foundation and was very damp which worried Alma, especially the steep path often covered with mud or wet leaves after a rain (the servant certainly complained about it, hauling his breakfast and lunch up to the hut every day). The hut contained a piano, a large work-table, two or three other pieces of furniture and a few books – a complete edition of Goethe, for one. The only musical scores there were by Johann Sebastian Bach. Around midday, Mahler would finish his work, go down to the lake for a swim. Alma would join him, sitting beside him while he sunbathed before taking another dip to cool off (Alma considered this a barbaric custom). He preferred taking walks to napping and walks quickly exhausted Alma who was now five months pregnant. Sometimes, he would stop, jot something down in a notebook, Alma hoping to find a tree-trunk she could sit on so as not to distract him if she became tired. It’s interesting, knowing this, to listen to the absolute serenity of the famous Adagietto of his 5th Symphony, which he was writing at this time. But while he composed these remaining two movements, Alma had little to do. She hated the interior of the house which was dark, pedestrian and, she thought, gloomy, though she enjoyed the garden and the view of the lake. She couldn’t even play the piano and it began to annoy her she had promised to give up composing herself in order not to disturb (or compete) with her husband. She confided in her diary, “There’s such a struggle going on in me! And a miserable longing for someone who thinks of ME, who helps me to find MYSELF! I’ve sunk to the level of a housekeeper!” She had found a heavy volume of philosophy in his study but yet it wasn’t anything that he would discuss with her. As if this period of adjustment, this realization of what the future might be like for her, Alma had to deal with the appearance of Anna von Mildenburg, the famous soprano from the Opera who, in years past, had been Mahler’s mistress. A native of Carinthia, she was staying in Meiernigg that summer and dropped by frequently to visit Mahler and his new bride, bringing with her a “wretched mongrel” dog she’d rescued from some beggar (Mahler hated the dog). Out of gentlemanly deference, Mahler would walk her back to her friends’ place but once he tired of this and gave his servant this particular chore, Mildenburg visited less often. One time, while Mahler was working, Mildenburg entertained Alma with several stories from Mahler’s past which, of course, implied there was an intimacy there for who but an intimate would know such things? When she told Mahler about this, he was intent on banning Mildenburg from the house, but Alma suggested a more diplomatic course. At the next visit, perhaps over dinner, he steered the topic toward Wagner and she ended up singing the final scene from Siegfried with Mahler at the piano – and better, apparently, than she’d ever done on stage. The sound of her voice carried across the lake and by the end, there was applause from the crowd that had gathered in their boats along the shore. It was around this time that Mahler wrote a song especially for her, well aware of the conflict going on in his young wife’s heart. 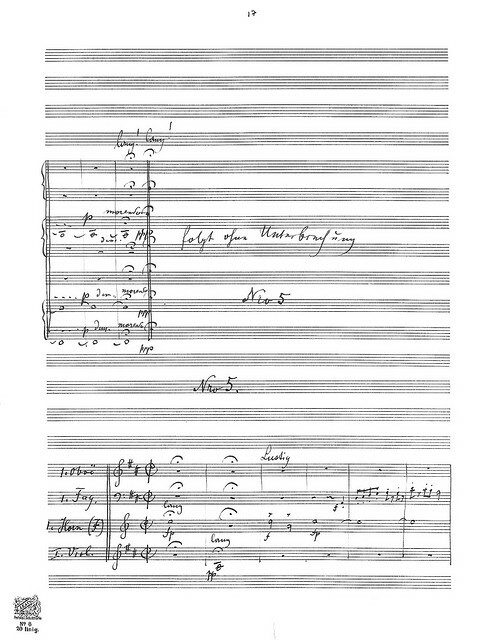 Mahler slipped the manuscript of “Liebst Du um Schönheit” (“If you love for beauty’s sake”) – another poem by Rückert – into her score of Wagner’s Siegfried which she always had by the piano and often played from, but for about a week it lay there undiscovered. So on August 10th, he finally handed the score to her and, when she opened it, the manuscript fell to the floor. In her memoirs, Alma would recall this story differently: then, she placed the event in the following summer. There are other statements that confuse the issue of when the Adagietto was written: some assume it must have been written the previous summer since it bears a strong resemblance to that summer’s song, “Ich bin der Welt abhanden gekommen” (“I am lost in the world”) but which has an entirely different mood (one could say, “meaning”); another statement she makes indicates it might have been written shortly after they met, sometime between November and Christmas, but with everything Mahler was busy with at the time – and he never wrote during the opera season at any other time – it seems unlikely no mention of it would have survived in their voluminous correspondence during those weeks prior to their engagement. When Mahler had finished the work, he took Alma "almost solemnly" up to the hut to play through it for her. She seemed to like it better than she did the 4th until they got to the big Chorale theme in the finale (at 12:17 in the above clip) which, to her mind, was "too ecclesiastical and boring." 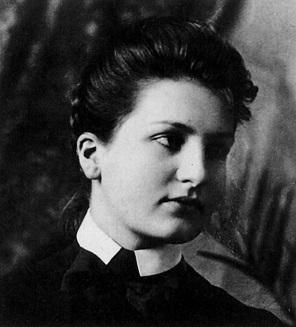 She got the conflict between Mahler's Jewish roots and his "strong attraction to Catholic mysticism" (he was more of a pantheist than anything, anyway) but still felt her husband's statement that Bruckner had used chorales in his symphonies also was moot: he was very different from the older composer. 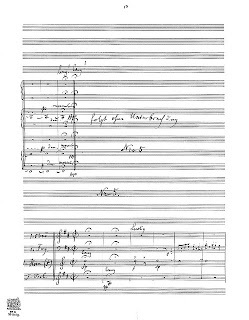 On August 27th, Mahler returned to Vienna with the draft score of the 5th Symphony under his arm. All that remained to do, now, was copy the score (a “clean score” to be sent to the publisher). This was winter’s work. But this is a story for another time – especially considering the symphony he would begin next summer, his 6th, which contained a theme he told Alma represented her. He had come down from the hut full of this lyrical theme in the first movement, a theme that was full of his love for her. But what to make of the rest of the symphony, with its three “Hammerblows of Fate,” the third of which “fells the hero,” the one he kept taking out and putting back in? At times, he called this symphony the “Tragic” Symphony – a dark contrast to the 5th even despite its having begun with a funeral march. The 5th Symphony was premiered after Mahler had already begun the 6th – what was it like for the composer to face the remembrances of the one summer with the music he was writing now? As for Natalie Bauer-Lechner, she never mentioned Mahler in her journals again and, in fact, ended up a sad case, dying in poverty in 1921, almost exactly ten years after Mahler. From her journals, her nephew published a condensed volume called Mahleriana in 1923. The original copies, several bound copybooks, passed through many hands over the years before ending up in a Mahler library in Paris, and several pages are missing. If nothing else, Natalie recorded Mahler’s thoughts about what he was writing and what engaged his mind when he was writing it, even down to the details, for instance, how a laxative had not only helped his constipation but had unblocked his creativity so he could suddenly compose a song in one afternoon. With Natalie gone, our insights into Mahler’s creativity have been replaced by Alma’s observation of her own situation, as if (at least during these first months of marriage) her husband didn’t confide in her about the music that was so central to his life or that she chose not to record it. There can be much more I could tell you about Mahler’s symphony from a technical standpoint – why it’s probably not accurate to refer to it as a “Symphony in C-sharp Minor” because, while it begins in that key, it spends very little time in that key (D Major is the main tonality of the Scherzo and the finale) and how Mahler used what we call a “progressive tonality,” moving from its starting tonality to its final one through some inner logic of its own – or even from a “program notes” standpoint – that it is divided into three parts, the first two movements before the central Scherzo, the last two movements afterward, like a vast arch – but the purpose of these essays was primarily to give the reader (and hopefully, the listener) some idea of Mahler’s life at the time he composed this work. There’s always an argument how valuable this awareness might be. We can certainly enjoy the music without needing to know about Mahler’s hemorrhoids (which was, unfortunately, an on-going health issue) or what he had for breakfast while he was writing, but I think it’s interesting (if not important) to realize that, first of all, the composers who write these masterpieces we are in awe of, were not marble busts operating in a reality vacuum but had to contend with balancing their creativity against the intrusions of a complex world which, in turn, makes them more complex as people. True, Beethoven, writing the tragic Heiligenstadt Testament at the time he was near suicidal about his impending deafness, was composing the boisterous finale of his 2nd Symphony that same month. But Mahler (and indeed most other composers) were not Beethoven: everyone, like the rest of us more normal people, are affected by what happens to us in different ways. If this reality affected the life of Mahler the Man, why couldn’t it affect the creativity of Mahler the musician? Of course, planning out the details of a work as vast as an hour-long symphony doesn’t mean the ups and downs of reality affected the daily work. No doubt a symphony starting with a funeral march and ending in triumphant celebration could be a general plan and had certainly been done before (Beethoven’s Fifth, the obvious inspiration: even the persistent rhythm of the opening trumpet call, which then permeates the first two movements, brings to mind Beethoven's Fate Knocks at the Door motive) – and no doubt such a plan might have been subtly tweaked along the way without straying from whatever initial idea he may have had. After all, the trumpet call that opens the symphony is a quotation from a list of signals and drumbeats used by the Austrian Army when Mahler was a child, growing up in a Bohemian town not far from the local barracks; the often startling contrasts of sad with vulgar music presumably stems from an often quoted and much dismissed incident in his youth when he apparently ran out of the house while his parents were fighting and heard the music of either a military band or a dance band playing something in a popular vein (it’s a story he told, but one wonders if it’s an actual incident or a fabrication of memory). So, there you have the incidents of a life at a time a particular work is composed. Draw your own conclusions. Gustav Mahler died in 1911, four years after their daughter "Putzi" died. Another daughter, Anna, would grow up to become a famous sculptor. 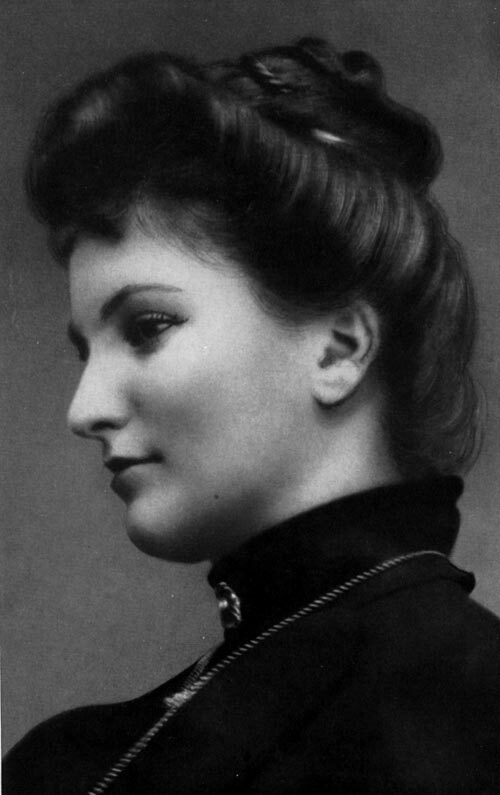 Alma Mahler would go on to marry the architect Walter Gropius (their daughter Manon, who died of polio at the age of 18, inspired Alban Berg's Violin Concerto) and then the novelist Franz Werfel. In 1946, Alma became an American citizen and died in 1964. 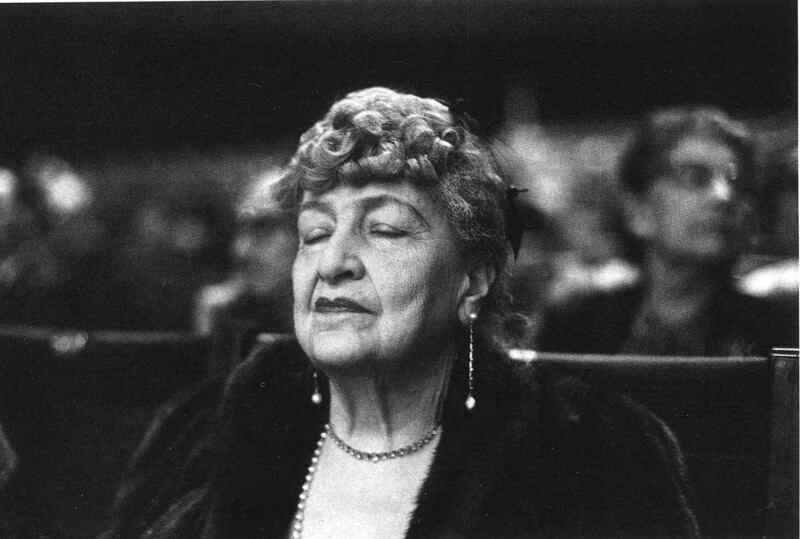 This photograph (above) from Life Magazine was taken of her (I believe in 1960) listening to a New York Philharmonic performance of a Mahler symphony. Most of the material and all the quotes included in these posts are from Henri-Louis de La Grange’s biography, Gustav Mahler, particularly Volume 2, “Vienna: The Years of Challenge (1897-1904), Oxford University Press, 1995 edition. You would need to consult this to reference the accounts of Natalie Bauer-Lechner and Alma Mahler, or Mahler’s own letters to his other correspondents. For this post, I've chosen the Bernstein videos with the Vienna Philharmonic mostly out of respect for Bernstein who almost single-handedly brought Mahler's symphonies to American audiences.